Home Weight Loss Articles Why We Should All Be Drinking! Drinking Is Good For You? As I watched my wife pop the top on another Diet Dr. Pepper, I had a strong urge to reprimand her. Luckily, my parents didn’t raise a fool so I kept my mouth shut. But the truth is that my wife and everyone else I know really don’t drink enough; water that is. You see, water is what our bodies want. We need it for every cellular function in our body, including regulating temperature. It also aids digestion and helps clear cholesterol out of the blood vessels. It also contributes to high brain functioning. But we just don’t drink enough of it. 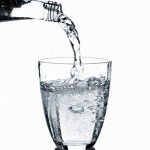 Do you realize that often when we feel bad or have aches and pains, it is because we are dehydrated? It’s true. 1. Wake up and immediately drink a glass of water. Your body has been without hydration for 7-8 hours (or 15 if you are my son on Saturday!). 2. Continue drinking water throughout the day. Try to consume a minumum of 8-12 ounce glasses every day. 3. Throw out everything else. No colas, teas, or even Powerades. Stick to water only for 7 days. 4. Evaluate the way you look and feel at the end of the week. I am betting you will have less allergies, aches, and generally feel much better. You will probably have fewer bags under your eyes, and clearer looking skin. And you will have made 1,262 trips to the bathroom! Give drinking water a try! Randy Jackson Weight Loss – His Success Story!